I hope you enjoyed our interview with Pat Gelsinger a few days ago. Today, we have another special treat for you. 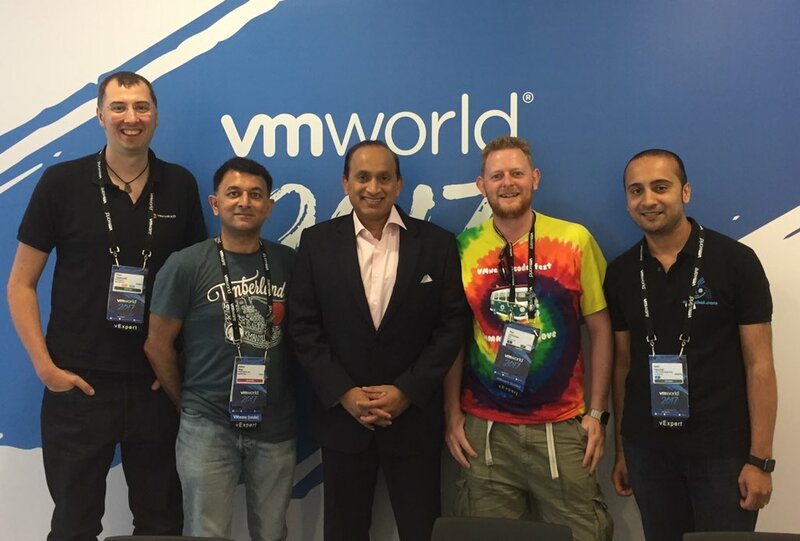 On Day 2 of VMworld Europe 2017, we interviewed Sanjay Poonen, Chief Operating Officer – Customer Operations at VMware. In the interview, we talked to him about life in general but also at VMware as COO, VMware strategy and cross-cloud integration – amongst other things. He also gave some very good advice to someone thinking about starting in the technology industry. …and we are go with our second #VMworld special podcast with @spoonen of @VMware – on the website & iTunes now, Stitcher very soon! I am also pleased to say that this time, we didn’t have any battery-related drama. Kev was not going to let batteries defeat him this time and attached a reasonably-sized battery pack to the recorder. We discovered that Sanjay is also a podcaster which also explains why he seemed to be enjoying the interview very much. Many thanks to him for taking the time to talk to us and I hope you’ll enjoy this episode too!